When Strides Physical Therapy embarked on the mission to provide wellness services to the general community in addition to therapy services to those in greatest need, we were extremely passionate about getting our message out. We felt we had so much great information to share from our studies and years of practice in the realm of pediatrics and movement development, but that information was not reaching a majority of families. We wanted to empower all families with greater knowledge about their growing babies and children, to provide information that sparked dialog and informed choices. And we especially wanted to reach the babies and children, who are ALL at risk for exercise deficiency, lack of motor proficiency, and sedentary lifestyles in our electronic, wireless, mobile world. We wanted to help bring some balance back into our lives to support a healthier future, one family at a time. Thus, Move Play Grow was born! 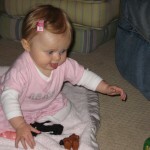 Babies at 9 to 12 months are really moving and grooving! They are in to almost everything and will likely be pulling to stand, cruising along furniture, and preparing to take those first few wobbly steps! This is also a bittersweet time for many parents (myself included) as you see your little baby vertical – even if holding on to something! Typically, by 9 months, babies are sitting unsupported and reaching for toys, crawling (tummy up or down) and by the end of this stage, babies are creeping, pulling to stand, cruising, and some may even be walking. Their ability to move in new ways (crawl, stand, even walk) makes it easier to explore and helps them make new discoveries. Play starts getting more fun since your baby is more alert and begins to become an explorer and investigator versus a passive play mate. At this age, baby starts to move too and, from here on out, won’t stop! A 4 to 6 month old baby is quite a charmer! He loves to smile, make silly noises at you (or anyone for that matter), to babble, and starts using his voice to get a reaction! This is also the time when physical development gets “rolling” at an amazing rate. 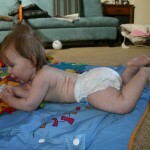 Baby begins to prop sit (with arms or support), push up more on arms in tummy time and begins to roll purposefully. Reaching becomes more and more accurate since eye hand coordination has improved. 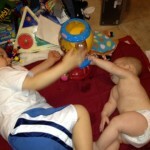 Baby will reach for anything (ask any older sibling) and likely put most any object into his mouth to explore it. Moving an object from one hand to the next will soon follow. Around this time, most babies begin to sleep better so parents get to come back from the land of Sleep Deprivation (even if it’s short-lived). With so many big changes, how can you maximize your play with this amazing little one? Below are a few ideas organized by thinking of baby’s senses! Sight: Baby is ready to check out all of the new colors he can now see. He now distinguishes between new and familiar faces which may mean a bit more clinginess to his primary caregiver. Make sure you point out things and talk about the environment surrounding him, encouraging exploration by holding him up on your shoulder. Mirror Play in a variety of positions (tummy, supported sitting) to let him see himself is always fun. Try “Baby, Do What I do!” Make various facial expressions (open mouth wide, puff cheeks out, stick out tongue) and see if he tries to imitate you. Peek-a-boo is a great game to play with you, siblings, toys, etc. 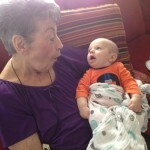 Baby will need help initially but, pretty soon, he will have this tricky game all figured out! 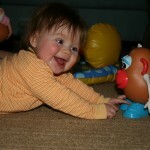 Sound: Rattles, maracas, and very simple cause and effect toys (with your help initially) will be quite fun for baby. Shake a rattle behind your baby’s head and let him or her turn and grab it. Baby still loves YOU the best so use your voice! Make silly sounds and mimic his sounds . . . the sillier the better! 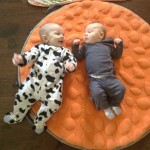 One of the cutest things I get to see these days are baby and his older brother “talking”! Make sounds for your baby. Clap your hands (help him clap his too because this will happen very soon) and help baby bang two objects together. Play music too. What about “zerberts”? Isn’t blowing on your baby’s chubby baby tummy the best? In our house, that crazy sound always gets a laugh! Remember, many sounds in the environment will be new and novel like a dog barking, bell ringing, music, etc. so be respectful! Movement: Dance with baby. Hold your baby in different ways (tucked in front, tummy, side) than your standard and dance away, sing, smile – in front of a mirror is even better! Or, make it a movement activity for the entire family! Always check on baby every 30 to 60 seconds by “freezing” or “waiting.” This gives your little one a break to let him process the new information and reset himself in a way. Give baby plenty of time on the floor each day. I know this can be difficult but this floor time is one of the most essential parts of development. It is the perfect surface and the perfect time for baby to spend time on his tummy, back, supported sitting, rocking on hands and knees all to build strength and skill to progress toward rolling, crawling, and walking. As this stage progresses, try and have baby equal time on all four sides of the body. 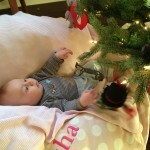 Other Helpful Hints: To help your baby focus, put out only one or two toys at a time. 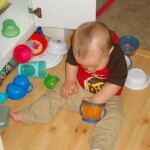 Be respectful of all that baby is learning and balance stimulation with plenty of quiet time. And, of course, be respectful of baby’s cues that he needs space or a break. Can you imagine having to learn so many things in such a short time? So many things are new as they move, PLAY, and grow! Enjoy the magic and the wonder! Continuing with the play theme, your 2 to 4 month old baby is definitely more alert, more interactive, and more interested in initiating exploring his world. You just need to give yourself permission to linger, to observe and to marvel. It will still take a while for him to organize purposeful movements, sounds, smiles, and coos, but if you linger it will happen. And then you will be addicted and do everything in your power to see him do it again! A 2 to 3 month baby smiles and coos, holds his head more steadily in midline, and controls gross shoulder movements to reach his arm in space towards something interesting. His favorite toy is still YOU, but you can also introduce bold colored or simply patterned books or toys (or safe Christmas ornaments). His gross reach into space will be more like a punch with a closed fist (no controlled grasp with hand yet), but when his hands are closer to his body and face or on an object, they will open and scratch at the surfaces. I caught my husband playing with Kellan on the changing table, giving and receiving “body blows” with right and left jabs and hooks. I LOVED seeing this because Neil entered Kellan’s world. He observed what Kellan was doing and gave meaning to it. Kellan’s blows knocked Neil a few paces backwards or to the side, and with every repetition, Kellan understood more and more that his movements were affecting his environment. He was in control! Smiles and coos followed. No laughs yet, but we are waiting to hear Kellan’s first giggle! A 3 to 4 month baby definitely exhibits more control, keeping body symmetrical right and left, top to bottom. Reaching is more refined and, when body is supported, head control is great with very little wobbling! This all translates into more refined play. 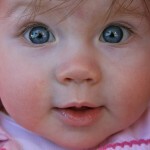 Baby will turn his head to your voice, follow you with his eyes, reach for and briefly grasp objects. Expect more cooing and smiling. And his favorite toy…..YOU! 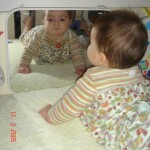 Faces fascinate baby, but if you need to step away, try placing baby near a mirror so he can see himself! Babies at this time are busy exploring all that they see. Because head control is greatly improved, eyes have the opportunity to fix themselves on different objects to study them. You will find baby staring at you and if in the right position, different parts of his own body (which he considers to be completely separate from himself). Though he can’t yet do it by himself, if you bring his feet into view, he will study them like they are the most amazing phenomena ever. This often elicits gross reaching and swiping at them. Self-discovery is so important, and this age is a perfect one to start “naked playtime.” Take his clothes and diaper off and in a warm room on a blanket or floor mat, place him on back, tummy and side and let him move around and explore in the buff. He will get his hand-to-hand, hand-to-chest, hand-to-face/head/mouth. If your house is just too cold, linger a little longer in the bathtub for the same experience. Other ideas include music and singing, starting peer time in playgroups (babies LOVE other babies…and it’s a great time for moms/dads to get together), reading (never to early for this), and lingering with the daily tasks. Your play will come naturally if you really observe your baby, enter his world and help him make sense of it. Be respectful of his needs and follow his cues, whether he wants more intense sensory experiences or to calm down a bit. Sometimes it can be a challenge to read your baby and know what they need, but through daily play and interaction, you will continue to know your little guy and love him that much more! What are some of your favorite play activities at this age? 1.) Legs Off/Flat on Ground. This is great for babies 2 to 6 months. Baby can activate it during tummy time, once he learns how to weight shift, and can also easily push buttons when sitting independently. Always make sure you supervise your little one as baby will likely bonk his face into the table during tummy time or tumble forward if a new sitter! If your baby is not yet sitting independently, you can provide assistance by supporting/putting your hands on the trunk. The lower your hands are, the harder he will have to work! 2.) Table with legs on/All 4 sides accessible: Your baby is ready for this around 9 to 12 months – when they start standing with minimal support and cruising. When baby is just starting to stand, he will likely lean on the table quite a bit so wedge the table in a corner (like between couch/wall) to prevent table and baby from toppling over! Baby will become more skilled at pull to stand and more controlled when squatting to sit back down. Eventually, you may notice a step or two to each side – that’s the beginning of cruising! 3.) Table Placed near another surface (couch): Your baby will likely be ready for this around 10 to 12 months. This may likely be the first time you see your little daredevil attempt to take steps on his own to reach the other surface. Creating safe opportunities to transfer between surfaces (especially YOU!) and allows your baby to build more and more confidence to eventually let go and step where he desires to go! Although they may come with a few too many bells and whistles, these play tables meet other requirements to make it a great toy to have as your baby grows: can be played with in multiple positions, can be played with in multiple ways, appeals to many senses, etc. Look for them on Craigslist, garage sales, or baby resale shops too. Most parents won’t realize how versatile these tables are and you can score a great bargain! Check out the other creative ideas in this link and always remember to supervise AND PLAY with your little one during these play table activity times! These jumpers look like so much fun and many parents think it is a great way for baby to exercise and gain strength in their legs. Although the American Academy of Pediatrics does not take a stance on the use of jumpers, the Consumer Products Safety Commission has banned many jumpers for design flaws. *The primary reason to avoid: RISK OF INJURY. Babies often jump too forcefully and hit their heads on the doorways or, even worse, cause the apparatus to come dislodged and crashing down. There are also other physical and developmental reasons why we recommend choosing a different product. *Babies are often placed in them before they are truly excellent independent sitters causing baby to hang in the sling seat. This puts undue stress on their hips. Because babies tend to jump forcefully in these things they do not learn slow controlled movements needed for walking. These jumpers do nothing to develop strength in the core and leg muscles for balance and walking since the movements are fast and ballistic instead of slow and controlled. 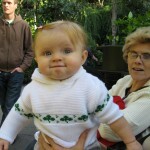 And, since baby is supported, there is no need to use any type of protective or balance reactions as would be needed in the beginning stages of standing and walking. There are better choices out there! If you really need a place to “put” your baby, consider the old fashioned “play pen” (pack and play) or simple floor time where they can reach for objects, roll, creep and crawl! We love toys that encourage movement. Yet, if you think about it, you can make many toys encourage movement. Think about using bean bags, puzzle pieces, blocks, or stickers as a means to encourage physical activity with your child. Set up puzzle pieces at one end of the room and the puzzle board on another. Have your child do a different animal walk to retrieve each puzzle piece! Side walk chalk can be used to draw hopscotch boards, obstacle courses instead of simply drawing! Bean Bags serve as wonderful items to search for in a scavenger hunt! Consider the “old school” toys for encouraging movement as well: balls, jump ropes, riding toys. With movement, encourage use of the arms and legs to build strength in the large muscle groups but also to work on developing balance and coordination. Jump ropes can be used as snakes to jump over and lines to walk along! 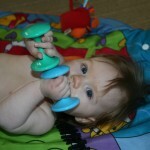 As a pediatric physical therapist and a mom, I have played with many toys! When I became a school therapist, I no longer had the luxury of being able to choose from many toys in many shapes and sizes. Instead, my therapy “equipment” had to fit in the trunk of my Toyota Corolla. I needed to have toys that were multi-functional, portable, and loads of fun. As the years have passed, it seems harder to find these toys. Toy manufacturers are making more toys that are either: one trick ponies, overstimulating, or oversized. Perhaps it is becoming a bit too much? With the ever expanding influence of electronic media, our children spend more of their time being passively entertained by or minimally interacting by way of an electronic device. Today’s toys use onboard computers that dictate the play experience. 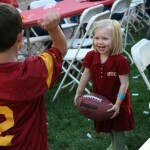 This robs children of both unstructured play with friends and individual creative play. 1.) Can the toy be played with in more than one way? Building toys (blocks, bristle blocks, tinker toys) encourage creativity, problem solving, and also focus on fine motor skills and hand strengthening. Stacking cups are another great option. This simple toy can be used to build, hide, scoop/pour, put in/take out. In fact, this link provides 20 different ways to use stacking cups. 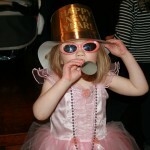 Think about some things that you may have used as toys when you were little! Tupperware, pots/pans, and cardboard boxes all inspire imaginative play in your little one for a fraction of the cost of many fancy toys on the market today. Stacking cups, measuring cups, Tupperware, and pots/pans can move from a play kitchen to the bath tub! You can “bake” many yummy items in the bath tub with cups and bowls and it also reinforces activities such as pouring/mixing (ingredients), counting (cups of flour), etc. 2.) Does the toy appeal to more than one sense? 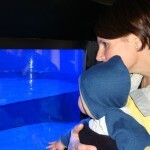 We want the child to be drawn to a toy and to remain interested. Often, bright colors, lights, music, and textures will do just that. However, be cautious not to provide too much stimulation! A toy that provides too much can have the adverse effect of shut down or disinterest. Instead of your child pushing a button and hearing music, consider musical instruments. They are portable, encourage rhythm and imagination. Helpful hint: if you do have a toy that is too loud, try placing tape over the speaker to dampen the sound. 3.) Can the toy be used in more than one place? 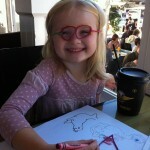 Wiki Sticks provide a great non-messy art project that can travel anywhere, especially to restaurants! Consider items such as crayons, write on boards, stickers, and small steno pads carried in a small bag for trips to restaurants, etc. Toys like wood puzzles and magnet toys (animals, letters, etc.) can also be moved from room to room. I have used magnet toys for many different activities as well. Remember, you can always use a cookie sheet to stick the magnets to if a metal surface isn’t always nearby. 4.) Can the toy be used in more than one position? 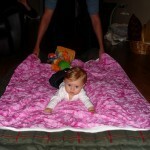 Play mats are great for tummy time but also for practicing side lying and for reaching up in supine. Books can often be read in more than one position. It is often a wonderful idea to encourage our children to read, write, and color on their tummies (strengthens neck and back muscles while providing shoulder and forearm stability) since most of their day is spent upright in sitting, standing, and playing! 5.) Does the toy encourage activity and movement? It’s never too young to play with balls! As a pediatric physical therapist, I love toys that encourage movement. Yet, if you think about it, you can make many toys encourage movement. Think about using bean bags, puzzle pieces, blocks, or stickers as a means to encourage physical activity with your child. Set up puzzle pieces at one end of the room and the puzzle board on another. Have your child do a different animal walk to retrieve each puzzle piece! 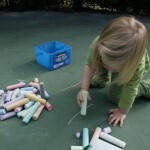 Side walk chalk can be used to draw hopscotch boards, obstacle courses instead of simply drawing! Bean Bags serve as wonderful items to search for in a scavenger hunt! In the end, make sure that the toy is developmentally appropriate for your child to prevent frustration and encourage independence. In therapy, we often work to find the “just right challenge” – making the activity challenging enough to foster growth but does not overwhelm them or cause frustration. Choosing the right tools for play is so important. Hopefully the checklist and ideas provided have helped you begin looking at toys in a new way and have allowed you to become more excited about the role of toys and play as your child moves, plays, and grows! Many parents are anxious or even fearful about the tummy down position because of its connection to SIDS. Just because an infant is awake, that anxiety does not dissipate, so parents often avoid placing their infants on their tummies from the start. In addition, parents are not aware of the importance of tummy time when babies are awake, so there is little reason for them to even try. Tummy time is important for many reasons. Babies are often positioned in utero in asymmetrical positions, and many stay in the same position for most of pregnancy. These asymmetries do not disappear overnight after babies are born. They need to be worked out with babies’ spontaneous movements against the floor and gravity. Babies need to have plenty of time to move freely on the floor, to be out of containers such as car seats, infant seats, swings, and strollers. The position of choice when putting an awake baby down should be tummy down. Newborn babies do not have the strength to lift their heads for sustained periods of time. They rest their head on the floor with their cheek in contact and their neck turned 90 degrees. As long as they position themselves looking both directions, gravity and the floor provide a long, low-load stretch on the SCM and other muscles implicated in torticollis. Tummy time also eliminates any pressure on the back of the head, preventing flatness or allowing any flat spots to round out. Parents should look at their baby from head to toe after birth to look for any asymmetries in baby’s preference for turning his head or flexing his body one direction or another. Parents can also take pictures of head shape over time to ensure that any flat spots round out. Keeping a photo diary or a log of activity over time helps parents to determine patterns that either exacerbate or alleviate any asymmetries present at birth. 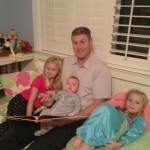 I looked at a few different smart phone applications that would help me do just this after my son was born. I settled on iBabyLog, which is a great tool to track nursing, diapering, sleeping, and activity schedules (many other categories are also available for tracking). I can customize my comments, take photos, and easily look at patterns over time to track progress. For example, when putting my newborn son down for sleep, I make sure that he looks to the left one time and then to the right the other. When working on awake tummy time, I also track the time he looks left versus right. With the ability to track and summarize positions and alignment over the day and the week, it is easy for parents to notice any asymmetries that are present. And, at this very young age, parents have the power to fix asymmetries early with great results. Using iBabyLog or other tracking tools to document positions during sleep and awake times can help parents to be more aware of their baby’s alignment. Proper alignment is a crucial foundation to symmetrical movement, which is essential for baby to properly achieve motor milestones. By being aware and tracking some of the foundation elements of movement, parents can intervene early and prevent medical problems in alignment and movement from ever occurring. * Plagiocephaly is a misshapen head secondary to abnormal and asymmetrical forces placed upon the skull as an infant’s head is growing. It causes a diagonal asymmetry with flatness on the back of one side of the head and protrusion of the opposite forward side. It affects the shape of face, position of eyes and ears, and shape and symmetry of joints of the jaw and cervical spine. Since “Back to Sleep” began, the incidence of plagiocephaly has increased from 1 in 300 to 1 in 15. Though many pediatricians state that misshapen heads are merely a cosmetic issue, there are two very important joints that articulate with and are affected by skull shape: the jaw (TMJ) and the upper cervical vertebrae (OA). Atypical alignment in any joint, but especially those that require simultaneous action of two sides, increases abnormal wear and tear, leading to premature joint breakdown, arthritis and pain. Though this is a well-known and accepted medical phenomenon, because the first “Back to Sleep” babies are only 18 years old, long-term consequences of this specific malalignment due to misshapen heads have not yet been documented in medical literature. * Torticollis is a shortening of the sternocleidomastoid (SCM) muscle on one side of the neck. Other neck muscles can be involved as well, but this muscle is most often implicated because of its long ropelike and very superficial location. When this muscle is short/contracted, your baby will have a head tilt to the same side, rotate to the opposite side, and prefer to extend head backwards rather than tuck his chin. Babies often avoid turning their head in the other direction and cannot achieve midline orientation of the head. Torticollis can be congenital, most often due to position in utero, or acquired, often due to asymmetrical head shape and positioning, such as with plagiocephaly. These two diagnoses frequently present together. * Brachycephaly is a flatness on the back of the head that is more symmetrical from left to right, but causes protrusions laterally on both sides, making the face and head wider than otherwise would be. It reduces the space for the cerebellum to grow and decreases the distance between the back of the head and spinal cord, possibly placing the spinal cord at greater risk for injury with any head injury. 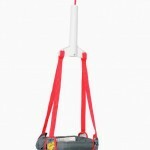 It also changes the orientation of jaw and cervical spine joints. Brachycephaly is due to constant pressure on the back of the head from sleeping and positioning in infant “containers” such as car seats, infant seats, strollers, and swings. The tummy down position for newborns looks awkward to adults. Babies have their little tushies in the air like a beetle, their legs tucked underneath them, and all their weight pushed forward on their upper chest and face. To most of us, that position looks like torture. To others, it may remind them of the yoga “child’s pose” that is meant to relax and center us, bringing our spirit back to a state of equilibrium. This position is actually exactly what a newborn infant needs to help calm and give them the opportunity to learn how to self-soothe. When newborns are on their tummy, the floor provides support to counteract the ballistic movements that are typical and can disorganize babies’ states of consciousness. Their arms are tucked underneath them with their hands conveniently close to their faces and mouths. Newborns frequently get their hands to their mouths when in this position. However, when on their back, they do not have the motor control to easily reach their hands to their mouths. The floor provides that support. Full term, healthy newborns can turn their head each way and effectively clear their airway when awake and placed on a firm surface, so there is no need to be concerned about suffocation when baby is in this position. They drag their faces, including cheeks, lips, and chin across the floor, which provides rich sensory information to those parts of the face. Again, conveniently, these are the parts that are essential for feeding; the extra sensory information provided by the floor causes more frequent firing of neurons in this part of the brain, and strengthens the pathways that are needed to reinforce successful feeding. In regards to vision, newborn infants see best 8-12 inches from their face. When on their tummy, parent and caregiver faces and voices (the best toy around) can easily be positioned in that precise spot so you can marvel, talk to and bond with your baby where they see you best. It also gives the parent an opportunity to lie down: Something all new parents need to do! Also, if babies’ hand happens to move a bit away from their face, they can visually regard it and start learning about self-discovery: Wow, that is MY hand! You can also start working on the coordinated connection/integration of auditory and visual information with behavioral/motor responses. By positioning yourself on the opposite side of way baby is facing and softly calling to your baby, they will first hear and then listen, locating your voice and the hearing sound of their name, responding with motor movements to try and turn their head the other direction in order to SEE the source of what they heard. This simple game helps to connect sensory information with motor output AND ends with an amazing gift to both you and the baby: They get to see your smiling face! 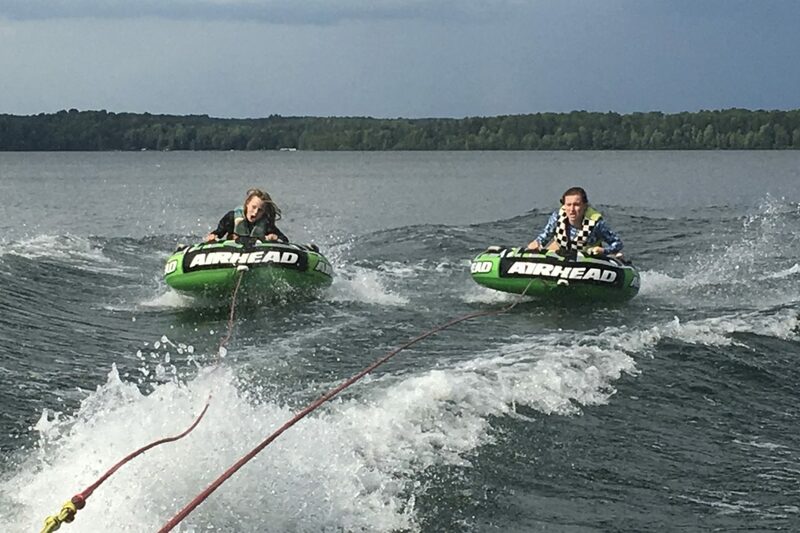 Added bonuses are that they 1) crossed midline in the process, which strengthens the integration of right and left sides of the brain, and 2) practiced looking both directions, increasing mobility, length, and strength of joints and muscles on both sides of the body. It truly is amazing how a simple game can positively affect so many systems and contribute to their development and maturity. 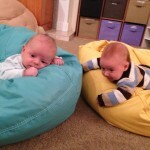 One of the best ways to ensure that your baby likes tummy time is to start at birth. If your baby is still not tolerating this position well after consistently practicing throughout the day for a couple of weeks (such as short times after each diaper change), there are many ways to modify the tummy-down experience to make it easier and more successful. Try chest to chest tummy time, lap soothe tummy time, and tummy down carrying. If you are still struggling to help your baby enjoy this time, live workshops and individual consultations are available in the San Diego area and online video consultations are available for those further away! A recent search for online videos of infants on their tummies highlighted a misconception that many parents have. Despite the very calm, happy babies that were on the floor on their tummies for minutes at a time, parent’s voice-overs indicated they thought they were torturing their babies, that they were doing this merely to follow doctors’ orders to force their babies to “workout.” Rather than interpreting what your feelings would be in this position, take the time to read your babies’ expressions. This position is one that calms and nurtures our newborns’ immature systems; it provides rich sensory and motor experiences that no other position provides; and it allows the opportunity for babies to build foundations in these domains that will positively contribute to development for the weeks, months and years ahead. Enjoy this position with your baby; it is one of the easiest and least expensive ways to support your babies’ development.